Marie Therese Douillard was born and raised in Chicopee, Massachusetts. Her parents were Alfred Douillard, from Canada, and Rosalie Bergeron Douillard who came from Holyoke Massachusetts. Marie Therese had seven brothers and one sister, all of them now deceased. A year after graduating from Holy Name High School in Chicopee, Therese entered the Marist Missionary Sisters in Bedford, Massachusetts on August 2nd, 1942. 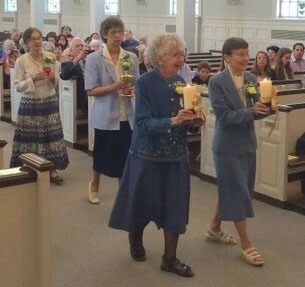 She made her first vows on February 2nd, 1945. On September 21st 1946 she set out for the Solomon Islands (then known as the “South Solomons”), an area that was just beginning to recover from the devastation of the Second World War. She would spend most of the rest of her life among the people of the Solomons, whom she loved so dearly, and served so competently. In the first few years she taught at Visale and Tangarare. In 1950 she travelled to Australia because of medical concerns. It was suspected that she had tuberculosis, but tests proved negative. 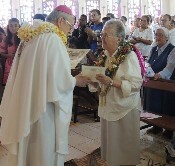 She made her perpetual vows in Killara on February 2nd, 1951, then returned to the Solomons and became novice directress for the local congregation, the Daughters of Mary Immaculate. 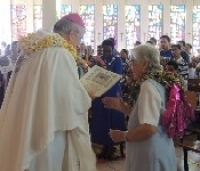 In 1957 she was appointed Regional Superior of the SMSM in the Solomons and served in that office until 1964, when she was appointed the first Provincial of the newly established Province of Australia. She came into office as the Congregation was being re-structured from independent units of “Regions” to a stronger united body of several of these units called a “Province”. This was not an easy task for Marie Therese and she suffered from being in, what was probably for her, a strange country and culture. However she was most faithful to this mission asked of her by the Congregation. It was the time of post Vatican II, a time of reorganization within the Church, and consequently in the Congregation. It was a time of insecurity and often of misunderstandings. Marie Therese brought her own sense of personal integrity to decisions she had to make in these troubled times. It is said she never held a Council Meeting without the Constitutions at her right hand. Under her leadership the Province did not suffer from the divisions or extremes of opinions, as had other Congregations at that time. As Provincial, Marie Therese faced the need of Sisters to be professionally trained, thus adding to the burden of those waiting for replacements. She established the rotation for Sisters experiencing the LTSR for the first time. All the while the concern for the care of the aged Sisters throughout the Province was in her mind. Searching for financial support was constantly before her. 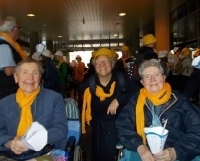 She saw “Lourdes” close as a TB Hospital to be reopened as a rehabilitation unit with the Sydney Mater Hospital. 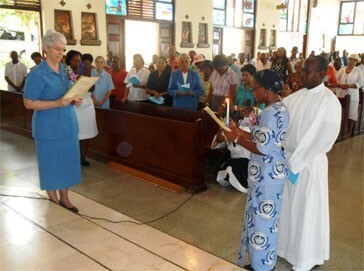 When her term of Office was completed she was missioned to the Solomon Islands where she worked untiringly to lead the local Congregation, the Daughters of Mary Immaculate, for whom she had great love, to their independence as a religious congregation with their own Mother General & Council. 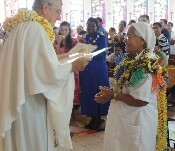 Then she was free to give herself to the greatest work she could do for the Church of the Solomon Islands. She was a gifted linguist knowing several languages and so she spent several years, in Tangarare, in relatively poor working conditions, while she translated, with the assistance of a team of DMI Sisters and Solomonese Laity, the complete Bible into the Gari language. In 1979-80 Sr Therese, in the USA for her home visit, took additional time to study linguistics and techniques in Biblical translation in Texas as well as Scripture courses at Pope John XXIII Seminary in Weston Massachusetts. For the next 18 years she devoted herself to this translation work and saw it completed before she returned to the USA definitively in October 1998. She had been having difficulty walking for some time and it was soon discovered that she had a tumor on the spine. After surgery in 1999, and despite extensive rehabilitation, she never fully recovered the use of her legs. She was at Bethany Health Care Center in Framingham for one year and then transferred to Maristhill Nursing Home in Waltham in October 2000, where she remained for the last 15 years of her life. 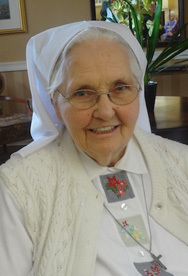 These last years were no doubt a time of suffering known to God alone… the swift transition from world of the Solomon islands to the world of health care institutions in the USA, the physical suffering, the increasing need to depend on others for so many needs of everyday life, and yet Sr Marie Therese continued to radiate an atmosphere of peace and inner joy to those around her. She enjoyed visits from her nieces and nephews, from Sisters and from friends she knew from the Solomon Islands. A couple who had served in the Solomons as Peace Corps workers years ago, Becky and Bill Bezzard, were very devoted to her, coming to visit several times a year. Many family members came for her funeral and many staff members and workers from Maristhill, who gave testimony to the impact she had had on their lives. May you enter fully into “the joy of the Lord”, Therese. We feel confident that, like your patron, St Therese of Lisieux, you will spend your heaven continuing to do good on earth.